The USWNT and Australia's Westfield Matildas renew their rivalry in a friendly match Thursday at 9 PM EST in Denver Colorado. 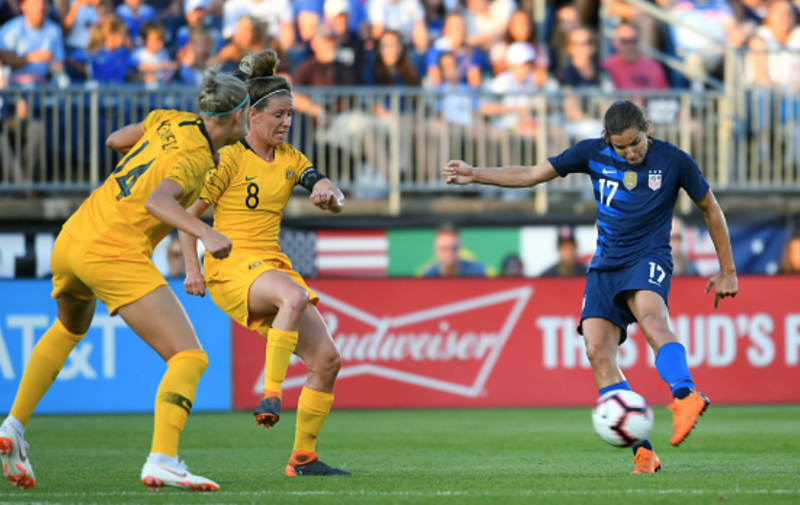 With nine weeks until the start of the 2019 FIFA Women’s World Cup the USWNT will faceoff against Australia to continue World Cup preparations. This will be the first meeting of the two teams since 2018 Tournament of Nations. Australia grabbed a first half lead from a Chloe Logarzo goal in the 22nd minute. The USWNT came back to equalize the match in the 90th minute off a Lindsey Horan header resulting in a 1-1 draw. USWNT would go on to win the Tournament of Nations four days later with Australia finishing second. Despite some struggles in the midfield and backline, the USWNT are still looking strong at forward. Tobin Heath, Alex Morgan and Megan Rapinoe continue to give opposing defenders fits. Morgan is one goal away from her 100th career international goal. Additionally Christen Press coming off the bench gives an extra boost of speed to the already dangerous attack. Julie Ertz and a healthy Sam Mewis give the Americans creative links to start any attack. Lindsey Horan will make her return to team coming off a leg injury. As the USWNT form up their offense, much still leaves to be desired on the backline. 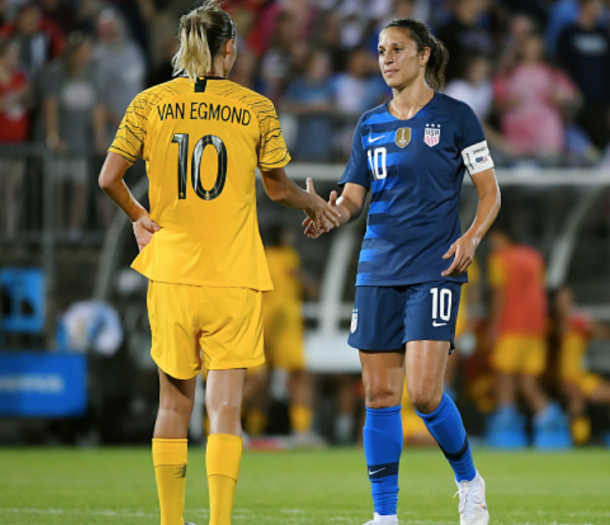 During the 2019 SheBelieves Cup, the backline failed to close out matches against Japan and England ultimately coming out with a draw against both. Be on the lookout for long time USWNT absentee veteran defender Ali Krieger to get some playing time on the backline. Krieger makes her return to the team and may earn her 100 cap if she sees the pitch these next two matches. Her veteran presence in the back may help an inconsistent defense regain their form with an injured Kelley O’Hara out of the lineup. Goalkeeper Alyssa Naeher will try to get back into goal after suffering an injury in the match against Japan in SheBelieves Cup. If Naeher is unable to go, backup Ashlyn Harris will try to earn back-to-back clean sheets. The Westfield Matildas are coming off an inaugural 2019 Cup of Nations championship defeating New Zealand, South Korea and Argentina. These were the first matches at the helm for new head coach Ante Milicic. Milicic replaced Alen Stajcic after Stajcic was controversially sacked at the beginning of 2019. Although the Matildas are coming off four straight wins, this will be the first major test before the Women's World Cup for Milicic and the Australians. Chicago Red Stars striker and Matildas captain, Sam Kerr, continues her impressive play. The USWNT will see familiar foes in Australia as some play in the NWSL. Hayley Raso and Caitlin Foord will join Kerr at forward. Crafty midfielders Emily van Egmond and Elise Kellond-Knight can help create quality chances. Exceptional defenders like Alanna Kennedy, Clare Polkinghorne, Steph Catley and Ellie Carpenter uphold the backline. Reign FC goalkeeper Lydia Williams will most likely get the start in goal for the Matildas. Australia is currently ranked sixth in the FIFA Women’s rankings. The match will kickoff around 9 PM EST from Dicks Sporting Goods Park in Denver, Colorado. The match will also be broadcast on FS1.